WordPress has many default settings that create the base for your shiny and new website or blog. Though some of these settings are fine to be left alone, there are others that some may prefer to have changed. 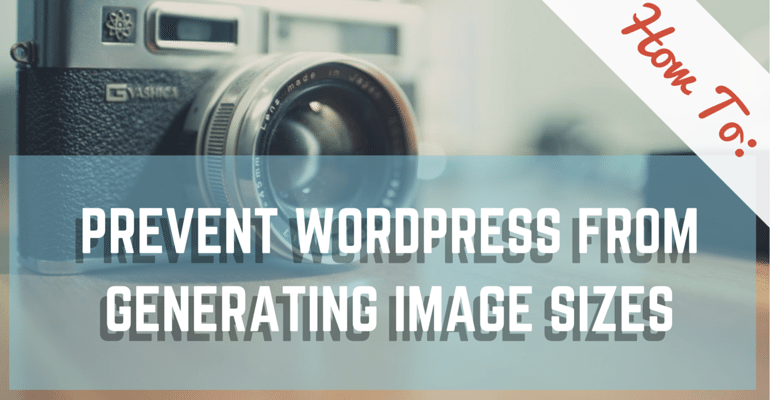 One such default action that WordPress will take from the get-go is generating various image sizes for the pictures that you upload to your media file. If this is something that you would like to prevent on your WordPress blog, then keep reading. Is there any particular reason that you may want WordPress to skip from generating these image sizes? Yes, in fact, there are a couple reasons why you might want to do this. It’s Often Redundant. When uploading an image to your Media file, there is a large chance that you’re only going to use it once and you are only going to use one size of it. However, if you keep the Media Settings as-is, then WordPress will actually create multiple versions of your image. Therefore, you will be left with extra images that are stored on your server that you neither need nor plan to use. Backups Can Get Time-Consuming. Creating a backup of your site is something that every website owner should do and do often. However, with your Media Settings left untouched over time the more pictures your add, the higher your number of unused images on your server become. As a result, creating backups of all the files on your server (which include these unused images) will start to take longer and even hours (!) depending on how many images it needs to save. (1) through your WordPress install and possibly, (2) through your designated WordPress theme. To cut out a large chunk of these images, you can tweak the setting in the back-end of your site. Login To Your WP Dashboard. Go to Settings and then, Media. Here you will find 3 various image sizes: thumbnail, medium, large. Decide which image sizes you won’t be using and then set those sizes to 0. Update and save your new settings. From here on out, WordPress will no longer generate additional images in the sizes you set to zero. The other area that you may want to check is your theme, as many WordPress themes have their own set of image sizes that it will generate. You can do this by using an FTP client like FileZilla and scanning through the directory marked /wp-content/uploads/ to see if this is the case. However, if you don’t know how to use an FTP client, then you can look for the following source code in your functions.php file to see if your theme is kicking out additional pictures that you don’t need. Go to your WP Dashboard. Navigate to Appearance and then, Editor. Find your theme’s function.php file and click on it (find it on the right-hand side). Search for the following code: add_image_size and/or set_post_thumbnail_size. If the PHP file contains that code it will appear there and that means that your theme is generating images. If no image_size source code is shown, then you’re in luck. If you find that your PHP file has the above mention code, then you need to delete the code(s) and update your files in order to cut those out. Just know that doing this will remove the ability to generate the images sizes that you may want to keep and prevent you from creating nice galleries, so don’t act too hastily. If you’re not sure if these are images sizes you want to get rid of, then you should probably skip this step and just stick with them until you’ve decided the route you want to take. There is a reason why we always recommend our users to use premium WordPress themes and plugins. All the themes on MyThemeShop are well designed and developed under a quality control extensive environment to help you set up an exclusive website for your readers. Do share in comments if you have any other strategy. I will try changing the settings on my wordpress blog now and I will see if it will work. There is a plugin called “Regenarete Thumbnails” which will resize existing images according to the new configuration. You can either regenerate the thumbnails for all image uploads, individual image uploads, or specific multiple image uploads with it. I Simply removed those lines from functions.php file. – As per latest WP version that world known solution of putting media settings to zero doesn\’t work anymore. It will keep generating extra images. – Also this option doesn\’t work: https://codex.wordpress.org/Function_Reference/remove_image_size. – For those who has found and removed the codes in their theme, they probably did the wrong thing, as the code was there because the theme needs it. – Concerning Regenerate-plugin. it\’s on everyone\’s mouth but doesn\’t delete any images, on the contrary: it generates them! – So the solution so far is the 2 plugins you specified (PerformancePack and StopGenerating). I hate to install another plugin for such a thing, but that\’s the only way to go. \”Find your theme’s function.php file\”? Are you telling people to mess around with the theme\’s functions.php without warning them about maybe losing the changes upon updates? great tutorial but resizing default image size settings to \’0\’ is not working anymore. should i remove following code from options.php file if i do not want these two image sizes as my function.php does not define additional image sizes however wordpress is generating additional 3 image sizes. how do we prevent WP from up-scaling the actual filesize (kb/mb) of the images it creates from the original. The GD WordPress uses is not very well made. I have a 954*500 picture that is 17kb in size and WP makes a medium out of it that is almost 200kb in size. We can’t control the up-scaling but, you can use plugins like https://wordpress.org/plugins/wp-smushit/ which can reduce the image size after cropping. Thanks for sharing. I was planning to turn off this feature but since it can probably break my images, I\’ll leave it as it is. You can always revert back if you are using an FTP (https://mythemeshop.com/blog/upload-files-on-wordpress-using-ftp/) Software. Though it’s always advised to take a backup of the file before editing. I will surely try this because I don’t want garbage images on my server. Do let us know, if you need any help, we are here to help. That’s really useful article! Thank you!! But people here are raising doubts about working of 0 value after wordpress updates. Is it so? Even then, I have put the value for large image as 0. I have a question : Can we keep the Thumbnails option alone with medium size also 0 although I keep adding images in posts. Will thumbnails size set to 650×450 work both for thumbnails as well as blog posts.? You can use 0 size for images you do not want to have images generated. Yes, you can set thumbnail size to 650×450 and use that inside blog posts. Thank you for this detailed post on image sizes. I have a quick question. My previous theme needed me to regenerate my thumbnails. I have recently switched themes where I do not need to regenerate thumbnails as they automatically adjust to the required size. However, I accidentally did a regenerate and now my thumbnails are smaller than usual. Is there a way to adjust the thumbnail size to fit the theme size or to revert back to the original thumbnail size? I have deleted the regenerate plugin as I will no longer use it. Thank you very much. Unfortunately, there is no way to revert unless you have a backup of your website. Or, you can ask the developer of your theme for the PHP code that you need to add to generate bigger image sizes to sort this issue. Thank you very much for your response i really appreciate it. Is there any way I can prevent new photos from becoming smaller? I don’t want all my photos future pics to be small or it defeats the purpose of having the new theme. There has to be a way for future pics being uploaded but i will find one just to fix this issue. That largely depends on the theme. If you are using one of ours, please open a new ticket here so we can help you with that.